Many of our students are decompressing after the excitement of the musical, but we do have the musical picnic now on the horizon, so keep singing! We also had a great Cultural Parade with the Gr 1 children. Check out the photos at the Facebook sire HERE. Please remember - there is NO SCHOOL MONDAY. 1. Gotta Keep Reading: I'll start with an interesting article on why we need to encourage our children to read for 20 minutes a night, and why we should read to our kids. The article is called Bill Gates shares this habit with successful leaders. 3. 1/2 Day Next Friday: Friday, February 19 is to be a 1/2 day, 12:00 pick-up. On this day, the faculty will be continuing the ongoing work on accreditation. This is a very deep process, which encompasses a review of pour professional practices in schools, and ensures we are aligned with the standards expected from our accrediting agencies, the Council of International Schools and Middle States Association. 4. Used Book Sale: Do your children have books they no longer read? Are some of your books collecting dust on a shelf? Please help us have a great Used Book Sale during Reading Week by donating your used books to the PTO. 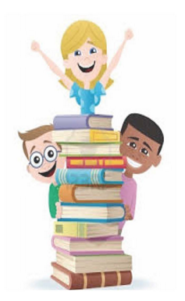 We will start collecting books NEXT WEEK– there will be a blue collection bin by the front of the school. Starting on 2nd March through 4th March books will be on sale by the front of the school. There will be books for all ages and in several languages. 5. Yearbook News: The cost of the additional yearbook has been changed to 10,000cfa. At the end of the year, each family will receive ONE FREE yearbook, and if you would like an extra copy for 10,000cfa, please let your child's teacher know. 8. Sand Play: I often think about how lucky our kids are having this wonderful sand playground for recess and weekends. They seem to agree! 9. Upcoming Movie Night - Feb. 26: A heads-up, as plans are afoot for a movie night for K-5 students (K-2 must be accompanied by their parents). Co-hosted by the Senior Class and our ES Student Council. 11. WAIST Softball: Finally, the WAIST softball tournament is on the next three days. If you enjoy watching sport, do come along! There is a faculty and a HS team taking part. It will be held at Ebbett's Field and ISD, with finals day on Monday.